When it comes to the subject of anti aging, there's no doubt in anyone's mind that our diet is one of the factors that has the biggest influence on how fast we age. Creating a diversified diet should be one of our top priorities but it can be equally beneficial to learn which are the foods that can help us delay aging the most. We all want to maintain a flawless, youthful appearance as much as possible. While the science of anti aging is constantly evolving and new breakthroughs are being made the basis of anti aging remains the same: a healthy lifestyle. One of the best ways to increase our chances of longevity and to maintain a youthful skin is to make sure that we create a variety diet that is able to provide our body all the necessary nutrients it needs to function properly. Avoiding high amounts of saturated fat, cutting down on processed salty and sugary foods and maintaining a healthy weight are the top things we should keep in mind if we want to meet our goals. In addition to these recommendations it is also a good idea to include in your diet or to increase the consumption of certain foods that have proven their abilities to delay aging time and time again. 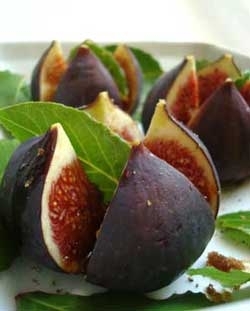 Figs have multiple benefits for our health. 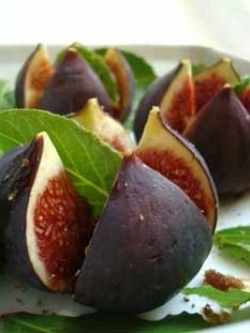 Rich in fibers and a lot of important minerals such as potassium, calcium, iron and and vitamins such as vitamin C and A, figs are a tasty treat that offers an important health and weight loss benefits. Containing more calcium than whole milk and more polyphenols than red wine they are an important addition to our anti aging diet. Certain studies even seem to suggest that this delicious fruit might have the ability to shrink tumors. Garlic is one of the kitchen staples that is often taken for granted and used mainly for the flavor it tends to add to a great variety of dishes. However, this inexpensive ingredient has a great variety of health benefits that we should take into account. Garlic has an amazing ability to protect cardiovascular health and to boost our immune system due to its antimicrobial properties. This amazing property might even help prevent stomach ulcer by decreasing the chances of getting the bacteria that causes it. What's more regular consumption of garlic can decrease elevated cholesterol levels, increasing our life span in a variety of different ways. Grapes are one of the best known fruits that have anti aging properties. The flavanoids contained in dark colored grapes are powerful antioxidants that combat cellular degeneration and resveratrol a compound that has multiple anti aging benefits from reducing fine lines to preventing wrinkles. Anthocyanins, a chemical responsible for the deep dark color of grapes also addresses another issue that becomes important as we age: memory. This substance tends to improve cognitive function and to boost memory. 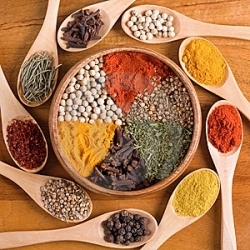 Curry, ginger, turmeric and cinnamon are some of the spices that have been intensely studied for their amazing health benefits. Aside from the antioxidants contained in them that contribute to their anti aging properties to a great extent some of these spices also have anti inflammatory properties. What's more cinnamon reduces blood sugar and cholesterol, being useful for diabetics and turmeric is believed to have an important role in preventing Alzheimer's. Raw nuts are an excellent source of Omega 3 fatty acids, a nutrient that is vital for the proper functioning of the heart and the the brain. Being a good source of vitamins and minerals such as zinc, potassium, magnesium and selenium they are extremely important for the health of our skin. They also raise HDL cholesterol levels (good cholesterol) while decreasing LDL cholesterol. However, these should be consumed in moderation because they have a lot of calories and might cause you to gain weight.